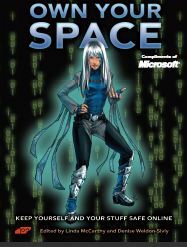 In effort to help teens to learn how to stay safe online, Microsoft has teamed up with security expert and author, Linda McCarthy to give away “Own Your Space – Keep Yourself and Your Stuff Safe Online” digital e-book in PDF and XPS format. The “Own Your Space” e-book is aimed to every teen who takes the time to learn about security and how to stay safe and be smart online. Chapter 1: Protect Your Turf. Chapter 2: Know Your Villains. Chapter 4: Hackers and Crackers. Chapter 5: Taking SPAM Off the Menu. Chapter 7: Phishing for Dollars. Chapter 8: Safe Cyber Shopping. Chapter 9: Browsers Bite Back. Chapter 10: Private Blogs and Public Places. Chapter 12: Friends, Creeps and Pirates. Chapter 13: Any Port in a Storm. Chapter 14: Look Pa, No Strings!. Besides that, chapter by chapter are also available for download from .